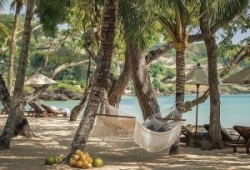 Cascading down a hillside to a sweeping bay, Four Seasons Jimbaran Bay is the perfect base for immersing yourself in on-site cultural experiences, all-day beach lifestyle, and the shopping, attractions and dining of south Bali. 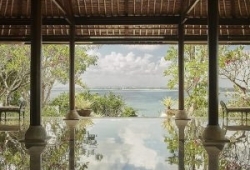 An expansive and elegant private Balinese villa inspired by traditional architecture awaits you. Soak up the ocean views from your plunge pool, Balinese-inspired spa rituals and dramatic hilltop and oceanside dining as you’re immersed in the mystique of this spiritual land. 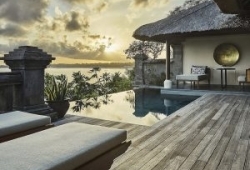 Reflecting the authentic ‘sense of place’, each villa layout is inspired by a typical Balinese courtyard house, with a thatch-roof sleeping pavilion that connects to the bathing pavilion, and a separate outdoor living area. Guests enter their utterly private sanctuary through colorful, carved gates that reveal indigenous gardens, contemporary Balinese décor and a seamless transition between indoor and outdoor spaces. Each villa’s Master Bedroom opens onto infinity-edge plunge pool, sundeck and open-air balé. A walk-through wardrobe connects to the bathing pavilion complete with oversized bathtub, double vanities, and both indoor and outdoor showers. The coveted Four Seasons Bed by Simmons provides a true sleeping sanctuary with a customizable mattress topper featuring heat-absorption and motion-separation design, and the ultimate in luxury linens, pillows and cloud-like duvets. 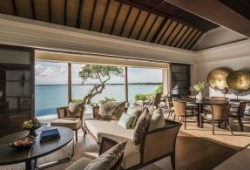 The Premier Ocean Villas offer maximum space and the best ocean views of the one- bedroom villas, with either ocean-front or elevated views across Jimbaran Bay. The spacious Bedroom is combined with an air- conditioned Living Area, giving guests the option of both indoor and outdoor living spaces. The poolside balé offers al fresco dining with direct access to the 194ft2 (18m2) pool. Interiors present a warm, relaxed sanctuary with wood-panelled walls and flooring, an abundance of natural light, stylish bathroom with oversized vintage bathtub, elegant décor and local artworks. 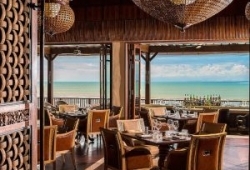 The Family Premier Villas offer elevated ocean views and convenience for families. The design and interiors are the same as the Premier Ocean Villas, with the addition of a Children’s Room featuring sofa bed, trundle bed, 40-inch TV and writing desk. A landscaped garden surrounds the entryway of each two- bedroom villa, which features an enlarged living/dining area, kitchenette/pantry, 161ft2 (15m2) plunge pool and two separate sundecks with views of the JimbaranBay area.Two-bedroom villas have twin and king bedrooms, with separate dressing rooms and double closets, private bathrooms, each with an oversized soaking bathtub, double vanities, and indoor/outdoor showers. Sumptuous and individually designed, the two Royal Villas boast spacious living/dining areas embellished with original Indonesian antiques and artifacts surrounding a lush tropical garden. 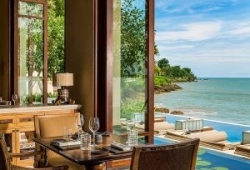 The Royal Villas’ prime shorefront locations offer sweeping views of JimbaranBay as well as convenient access to resortfacilities.Each Royal Villa has two spacious bedrooms with attached bathrooms, featuring deep-soaking bath, indoor/outdoor showers and double vanities. Guests enjoy a private 280ft2 (26m2) swimming pool, sauna, spa, cold plunge pool, and two large sundecks. Kitchen pantry and services of a live-in butler are also provided. Nine elegant, sprawling Residence Villas offer the ultimate privacy in a calming, tropical setting with instant access to the beach and dedicated, around the clock service. Comprising Two- Bedroom, Three-Bedroom and Four-Bedroom Residences, the secure estate offer the utmost privacy, surrounded by lush vegetation and mature trees. Each Residence has a main house; a two-storey thatch-roof pavilion with soaring ceilings in the open-air living and dining areas, and adjacent sunken lounge. 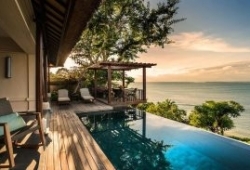 The main house looks over grand manicured gardens and stunning water features, and the huge living area offers direct access to the 807-1,399ft2 or 75- 130m2 swimming pool with sundecks, recreation areas and an open-air Balinese bale for relaxing. The second floor of each Residence is home to thepalatial master bedroom with an attached living room and ensuite, featuring oversized bathtub and indoor/outdoor shower.Additional bedrooms are housed in separate pavilions with direct swim-in access to the pool. Richly-textured Balinese fabrics and artefacts plus the latest technology combine with Four Seasons renowned service standards to create a peerless Bali vacation. Each Residence Villa has staff quarters, a large open plan kitchen with discreet side entrances to guarantee guests’ privacy when entertaining or for delivery of provisions.